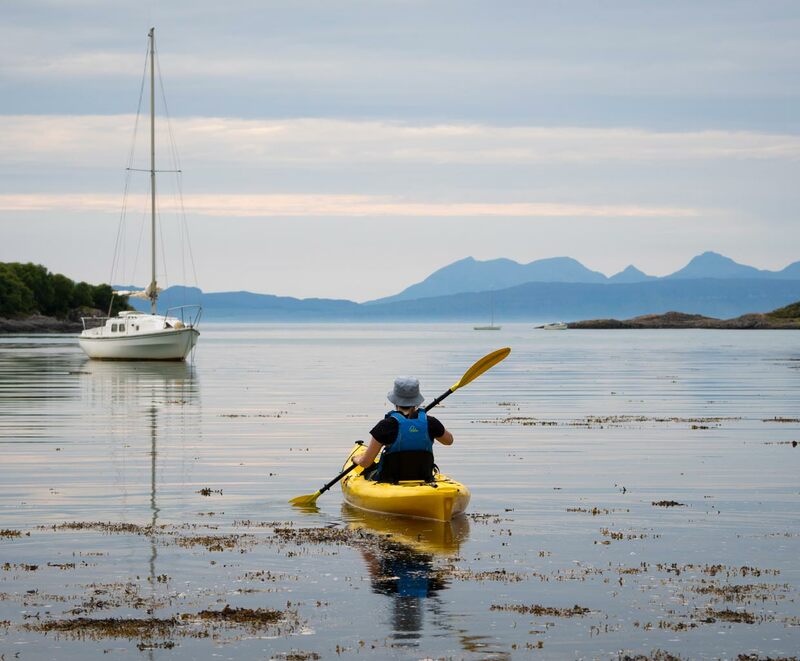 WHAT TO EXPECT A short kayak tour exploring wild and beautiful sea Lochs close to our base in Arisaig village. We'll complete a short journey paddling past small islands, watching swimming Seals and exploring the coast, if you are new to kayaking then we'll show you all you need to know. We use touring sit on top kayaks that are very stable and very easy to handle and there are places where we can land on a hidden beach or small island. 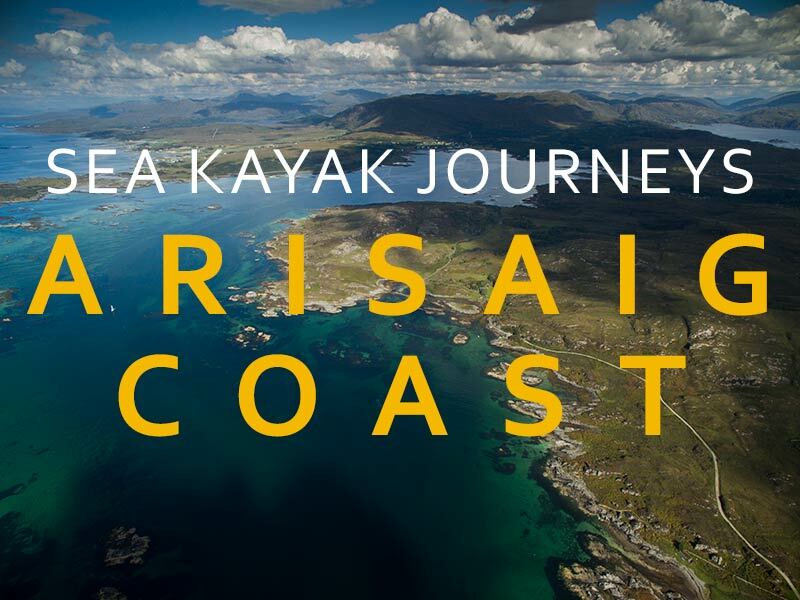 HOW OUR TRIPS WORK Explore the beautiful Arisaig coast on a group kayak journey. Our guides choose which Sea Loch to explore based on their expert knowledge of the Arisaig coastline and the sea conditions. Suitable for families (see guide in the trip information below). Suitable for beginners or experienced paddlers, although experienced sea kayakers or anyone wanting a longer sea kayak journey may want to consider a sea kayak day trip or family sea kayak day trip instead. KAYAKS We use single and double sit on top kayaks for our half day tours. These kayaks are very stable and easy to paddle. Scroll down to read about our trips or click here to go straight to the detailed trip info. 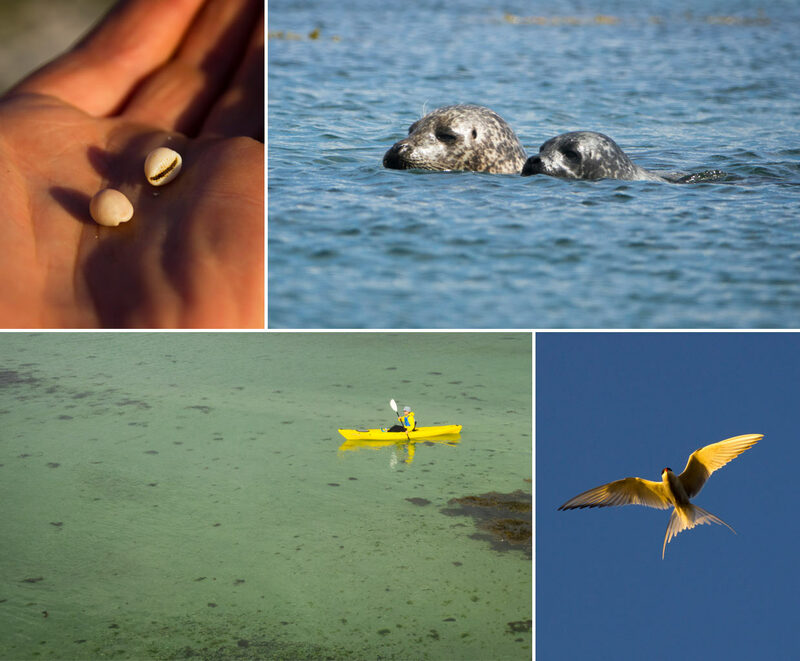 *EXPLORING LOCH NAN CEALL - The islands and coast of the Sea Loch invites us in to explore - the strip of white sand, the glimpse of a common Seal, the little flashes of Oyster catchers and Terns. The glide of a kayak places you closer to the detail of this landscape than anything else - reaching out you can touch the rock and seaweed or land on a beach and feel your footprints etch into the soft sand then dig your fingers into the mass of shells to get lost in the search for something unique. The sand and sea always rises and falls in the time we spend here: sometimes supplanting each other with a shimmering, tropical clarity. Look up and the jagged fingers of the Isle of Skye stretch into the distance, look back and the neat, white houses of Arisaig village nestle far away at the foot of mountains and clouds. Spend time here and you'll be fascinated by the rich palette of sea and sky that is ever changing. When the mist shrouds the hills it is easy to get lost in the drama and intrigue of the West coast when we imagine the Jacobites gathering their rebellion in the rough bounds or the open boats of the Island Kingdoms plying their way between distant harbours. START AND FINISH All trips meet at 09.30 or 13.30 (please don't arrive more than 10 mins early) at Arisaig sea kayak centre, Arisaig village, PH39 4NH. KIT LIST All specialist kayaking equipment and clothing can be provided, see our kit list for full details of kit we provide and what you need to bring. GROUP SIZE Up to 8 people on most of our group trips, or up to 12 with 2 guides. We can also cater for private group trips for larger groups. EXPERIENCE REQUIRED No experience required - these trips are suitable for beginners. These trips are suitable for families (all under 18's must be accompanied by a parent). We have a recommended minimum age of at least 8 years old get the most from a trip. Most kids younger than this are not able to contribute to paddling and would simply be a passenger in the front seat of a double kayak and therefore require a parent to confidently handle the double kayak on their own. Generally from age 8 upwards kids have the ability to use a paddle and the ability to regulate their own temperature, comfort and effort. All kids are different so this is just a rough guide, you know best how your kids react to being active and out in the elements and so are best placed to decide whether they will enjoy sea kayaking. Will my kids enjoy sea kayaking? Sea kayaking is an adventure activity - it is subject to the natural variations in weather and the sea and requires physical effort and a positive attitude to have a great time sea kayaking, due to these things some trips are naturally harder than others and the activity does not universally suit everyone. Every kid is different and sometimes its very hard to tell how they react to being in a kayak; if your kids love being outdoors or are sporty and naturally adventurous then they will have a great time. 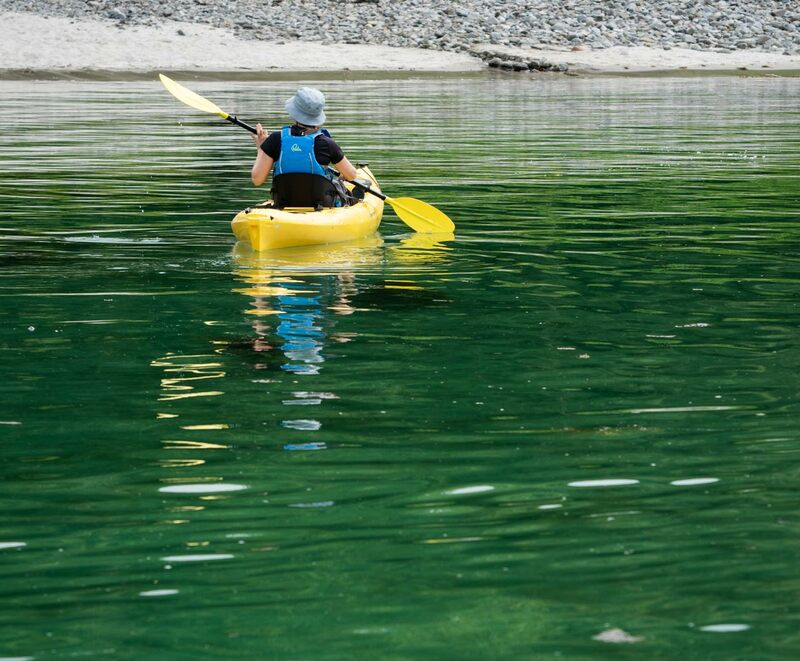 If your kids are naturally a bit more nervous or don't like exercise then they may find a trip tougher but they may have a greater sense of achievement from a kayak trip. If, as a family you don't spend much time in nature, out in all weathers then it may be harder to gauge whether being out on the sea will result in a good time. It is rare that kids don't enjoy sea kayaking though and our guides are expert at working with mixed groups, different ages of kids and different styles of learning - we'll adapt what we do to suit your family, showing you what you need to know and practice to have a great time journeying in a sea kayak.  What type of kayaks will we use for the kids? We use different types of kayaks for different ages of kids and different groups. We mainly use double sit on top kayaks, with an adult in the back of the kayak and a kid in the front, these are used for kids who haven't been sea kayaking before or are more nervous or generally for most kids age 12 and under. For a kid to paddle their own sit on top kayak then they need to be fit and confident enough to keep up with adults paddling on their own. Due to the smaller muscle mass and lighter weight of kids under about 12 then they would usually struggle paddling their own kayak. Every kid is different though and this is just a general guide. The guide will choose kayaks for the group based on the conditions and the ages, experience and confidence of the group. Sometimes if its windier then the whole family may use double kayaks as this makes it much easier for everyone. The guide always has final say in which kayaks are used as it relates to trip safety, we'll take into account your preferences but best not to tell your kids that they can definitely have their own kayak. What is the difference between a sea kayak day trip and the half day kayak tour? The types of kayak used are different - on a sea kayak day trip we use full length sit inside sea kayaks. On the half day kayak tour we use shorter touring sit on top kayaks. The shorter touring sit on top kayaks are very easy just to jump on and go, and so with the reduced time available on a half day trip they allow us to take to the water much quicker. They are also incredibly stable and its very difficult to fall off or flip them (the closed cockpit kayaks we have are also stable models) and so they are suited to trips where we are just enjoying being out on the water on a short journey without any need to paddle a longer journey. A half day trip is good if you want a casual, fun, short journey on the sea, or if you are nervous of being in a sit inside kayak. The time on the water is much longer on a sea kayak day trip. This allows us extra time to cover the extra skills and knowledge needed to paddle a sit inside sea kayak and to enable us to journey so much further - taking advantage of the speed and journeying capability of a sit inside sea kayak. A day trip is a better choice if you are looking for an introduction to sea kayaking where you will gain some knowledge and skill that will help you understand the sport and go on future trips. A day trip is also a better choice if you like the idea of a more immersive journey where we will explore an area for longer and spend more time ashore in wild places. The physical demands of both trips are fairly similar and within the capability of a beginner (see the fitness question below). We also offer a family sea kayak day trip if you are looking for a longer trip suitable for your family group. We don't publish a set route for any of our trips. The guide will choose a location that suits the conditions on the day and the experience and needs of the group - this is the safest and best way to operate sea kayak trips in Scotland. Individuals, couples, small groups of friends and families. What kind of fitness level do I need to take part? Sea kayaking is similar in intensity to walking - its is moderate aerobic exercise involving lots of different muscle groups but mainly the muscles of the torso and upper body. It places a light but repetitive load on these muscles - you don't need to have big muscles but you do need to be capable of sustaining a moderate level of physical effort. If you don't do any exercise, don't enjoy physical effort or have a very low level of fitness then you may find sea kayaking challenging. The most important thing to note is that we are here to enjoy the journey - we'll take plenty of breaks and paddle at an achievable pace. The physical demands of both trips are fairly similar and within the capability of a beginner (see the fitness question above). How far will we paddle? Sea kayaking is all about journeying and so we'll use most of the time we have on the water to complete a journey. We'll start in a sheltered bay to get used to being on the water and to get used to handling the kayaks, we'll then journey from there, usually following the coast for three or more kilometres. The weather on the West coast of Scotland can vary through the course of the season and from area to area - Scottish islands and coastline can see dramatically better weather and more sunshine than more mountainous areas inland. The wind speed and sea state are the primary factors that affect whether we will run the trip - if the conditions are dangerous then we will cancel and you won't be charged (any deposit paid will be refunded), we can try and re-schedule if possible. You should note that it is very rare that we have to cancel trips. For full terms and conditions see the link below. You can read more about the weather/cancellation/booking on our FAQ page. A 50% deposit is required at the time of booking, the balance is due 14 days prior to the trip, for cancellation policy please see our full terms and conditions.